"The way I was taught, being black was a plus, always. Being a human being, being in America, and being black, all three were the greatest things that could happen to you. The combination was unbeatable!" African American Soprano Leontyne Price was born Mary Violet Leontine Price in Laurel, Mississippi, on February 10, 1927, the daughter of James and Katherine Price. Leontyne was a very musical child and became a local success at an early age. She was nurtured under the watchful eye of the community, her musical talents were encouraged and her voice was frequently heard at area social events. Price received a scholarship to attend Central State University where she began as a Music Education major, however, she completed her studies in Voice. 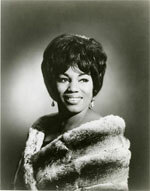 With the assistance of Paul Robeson and the school's administration, in addition to the financial backing of the Chisholm family, Leontyne next attended Julliard. At Juilliard, she received voice training from Florence Ward Kimball, a distinguished teacher, and, in her last year, she gave a strong performance as Mistress Ford in the student production of the opera, Falstaff. After seeing her in this production, Virgil Thompson invited her to star in his opera, Four Saints in Three Acts, which ran on Broadway for three weeks in April 1952. Less than two months later, Price made her debut in Dallas, in a role that would carve her name in the minds of audiences everywhere; she appeared as Bess in a revival of Gershwin's Porgy and Bess. On July 2, 1958, she had a triumphant debut in London, at Covent Garden, and two years later, she played Aida to a packed house at the venerable La Scala on May 21, 1960, becoming the first black singer to sing a major role at this citadel of opera. In March 1967, Ms. Leontyne Price sang a benefit concert for Rust College at the Mississippi Coliseum in Jackson, which netted the college $34,000. 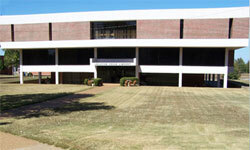 From this beginning, Rust College became another campus with a new library that occupies a central point on the campus. The award-winning building was dedicated on December 14, 1969, in honor of this famous Metropolitan Opera singer, the Leontyne Price Library. The architects-Gassner, Nathan/Browne located all library functions on the top two floors, placing meeting rooms, classrooms and other non-library functions on the ground floor, including a small gallery area for exhibiting art. The second and third floors are large open spaces for individual study carrels along the perimeter walls. Expanses of glass at lounge reading areas combined with a central sky lit two story space let light into an otherwise enclosed area. The information desk, office areas, media room and technical service department are located on the second floor. The third floor houses individual study rooms, a listening room, audio visual room and two special collection rooms in addition to open stacks. The volume capacity of the Library is 125,000. The library plays a vital role at the college because, combined with the faculty, staff and administration, it forms the nucleus around which the institution builds its educational program. In order for the library to render effective service, it is necessary that its aims and objectives are in keeping with those of the institution. When this situation exists, the library will be serving a positive educational factor. If the desired objectives of the college are to met, the facilities and services of the library should be used to the fullest extent by all persons connected with the college. Copyright 2019. Rust College. All rights reserved. || Web Site Designed by SIRIUS WEB SOLUTIONS.